It has been over a month since the last newsletter. Butterflies have been slow to show around the Container Butterfly Garden besides Monarchs, plus, I've been out of town for two weeks doggie and house sitting for two dear friends of mine. My son, his wife, and my grand daughter have also been living with me off and on for the past month, getting ready for their move out to Pennsylvania where he will be going to school for a teaching degree. The concept of a container garden is a sound one, but has eventually proven the location this garden is in is not very conducive to attracting and maintaining a variety of butterfly species. Most mobile home parks situated in SoCal are generally devoid of vegetation it seems, whose landscapes are mostly made up of lots of gravel, maybe a few rocks, and inhabited by mostly grufty-looking shrubs that offer little, if any, forage for nectar sippers. Quite a few butterfly species come through here (albeit in small numbers), visit for brief, fleeting moments, only to move on to other pastures. I was unknowingly quite spoiled by the order of magnitude the Alta Laguna Park Butterfly Garden in Laguna Beach, California attracted and sustained. My thoughts when thinking out and creating the container garden were, as in the iconic movie "Field of Dreams" starring Kevin Kostner, "If you build it, he will come." premise, then surely if I offer a varied and bountiful plate of nectar offerings, logic assumes that there will be an abundance of devoted, lingering butterfly guests. Didn't work out that way. Having a bit of time away from the day to day routines of the garden recently, allowed me to reassess it with several points in mind. One large point was the sustained drought we've been experiencing and the need to conserve water. Why water plants that don't have a "point"? Climatic prognosticators are now saying that a strong El Niño is virtually assured for this coming winter, but that won't help much regarding the dearth of visiting butterflies here, which is another point. 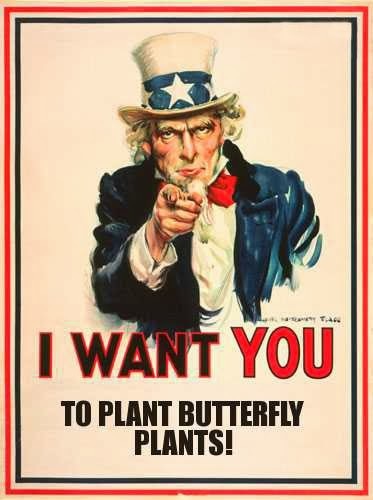 Instead, the focus will be on Monarch butterflies and milkweed plants. Right now, the container garden is home to five species of milkweed, two of which are native to California and our U.S. western region. There is a consistent Monarch butterfly population here that regularly lay eggs. I have caterpillars in almost all stages of growth, and watching Monarchs lazily flit about the garden is so restful and serene.